Invasive species are any living organisms (plant, animal, etc.) that are essentially out of place. The federal government defines them as “a species that is nonnative or alien to the ecosystem” and “causes or is likely to cause economic or environmental harm or harm to human health”. Whew. That means the organisms were introduced to a new area where they were not previously found, then learned they could survive there and multiplied. The introduction and success of these species, whether through good intentions by acting as a biological control or due to accidental spreading, can oftentimes become a problem for the native species in the area. Some of the main problems might include them becoming a new predator that a native species is not adapted to dealing with, resulting in population decline. It can also act as a competitor toward native species for similar resources such as food, water, or habitat. This can lead to population decline, as well. At the very least, it will cause generally unhealthier organisms. An invasive species might be carrying different pathogens and diseases than what the native species are capable or equipped to handle. This can potentially be catastrophic and cause a quick demise of a fragile ecosystem. Judging by just a few of the problems that invasive species can create for the preexisting inhabitants of their new environments, it is clear that they are a threat to healthy ecosystems. 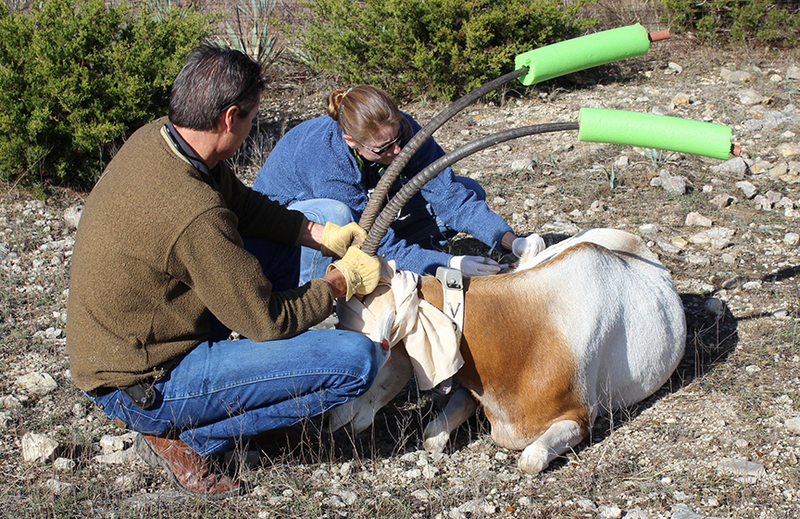 To boil all of this down to something relevant to you, as someone celebrating Earth Day 2019 and reading Fossil Rim’s blog, let’s discuss the worst invasive species found right here in Texas. These species may or may not be present at Fossil Rim, but they do impact the ecosystem directly around us. 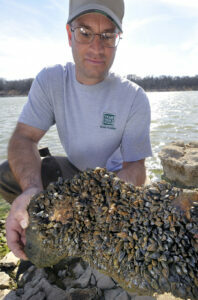 The worse invasive species in Texas is zebra mussels. This mussel from the Black Sea and Caspian Sea is a major threat, taking over various Texas lakes and threatening the Trinity River Basin. They are responsible for economic destruction, as they adhere to boats and buoys and are impossible to remove. They also outcompete local mussels, fish, and birds for plankton. Their efficiency in filtering plankton results in clearer water that is warmer and allows light further down. Besides pushing temperature ranges out of the comfort level of native species, it allows for more and larger algal blooms with the increased sunlight. 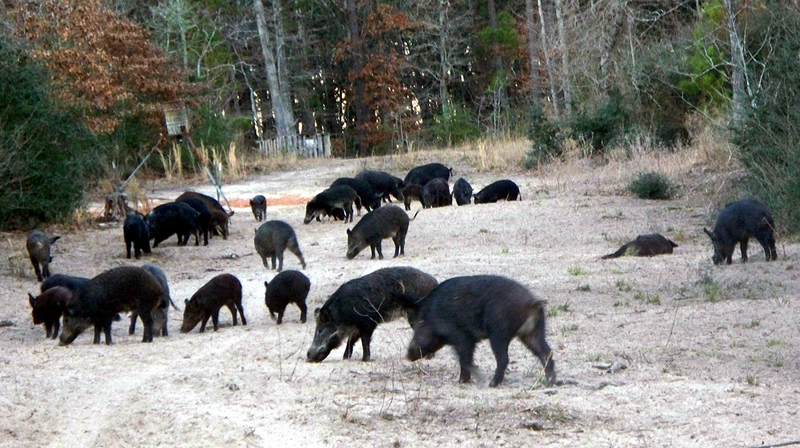 Feral hogs search for food in East Texas. They are destructive to agriculture, livestock, and native forests alike. Feral hogs are another destructive invasive species, ranging from Texas to North Carolina, plus California. Introduced to the United States in the 1500s by early explorers and settlers as a source of food, they have some commonalities with our pot-bellied pigs here at Fossil Rim, especially being adept at rooting and digging. Destruction is done while these hogs are searching for the best plants, tubers and roots at the cost of any other plants, important habitats, or private property in their way. This leads to habitat loss, plant loss, and soil erosion. The uprooted habitats don’t grow back the same after they are disrupted, thus allowing other invasive species to inhabit the areas, changing them completely. Feral hogs also upset livestock in the area and compete with our native fauna for precious resources. The final species referenced for this blog is red fire ants. We all know these nonnative pests. They bite and are a general annoyance. They also outcompete the native ants and other insects of the region. One of our beloved and highly endangered species here at Fossil Rim, the Attwater’s prairie chicken, is particularly susceptible because their diet relies on native insects the fire ants also eat. The ants are encroaching on the last one percent of coastal prairie that these prairie grouse are native to. Red fire ants are a dangerous invasive species, particularly to Attwater’s prairie chicken chicks. Worse yet is the prairie chickens are ground nesters, so red fire ants will attack newborn chicks, killing and eating them. They also eat unhatched eggs they find. The adult birds do not fare much better, as they, or any other species that disrupt these ant mounds, are quickly assaulted and potentially injured until they rid themselves of all ants that might crawl onto the birds. Alright, that was a dark and worrisome overview. There is hope, though, and that is our goal for this Earth Day – what you can do. You can check boats and equipment for zebra mussels before moving between water bodies. You can add fencing and crop protection against feral hogs. You can support hunting efforts to reduce their numbers. 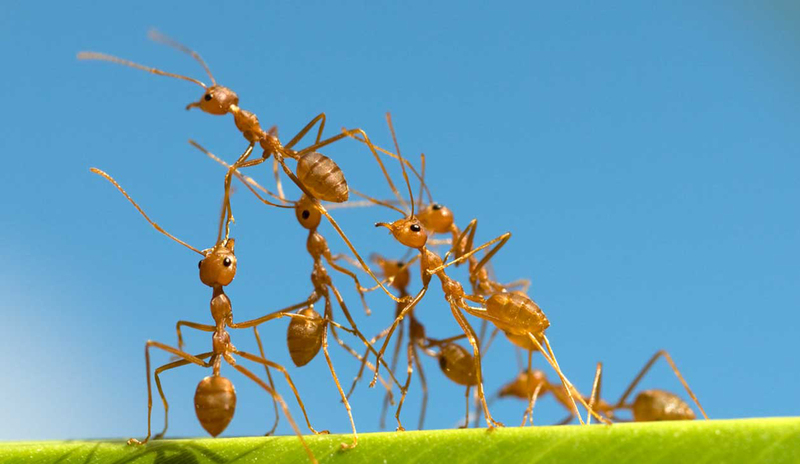 Finally, you can help prevent fire ants by adding Dawn dish soap to mounds or using botanical insecticides derived from plants that have fewer harmful side effects than synthetic chemicals. Happy Earth Day to everyone, and thank you for caring to make a positive change to our planet!